In an electric mixer, beat the Egg Whites until soft peaks form. Slowly add the Sugar, Salt and Vanilla, while still beating. Continue beating until stiff peaks form. Gently fold in the Coconut (by hand with a rubber spatula). Drop the mixture from a tablespoon or use a #60 food scoop; place about 1 inch apart on the cookie sheet. Allow to cool before using. 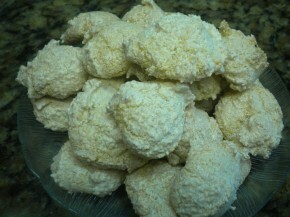 * If you cannot find Macaroon Coconut, simply chop the Coconut in a food processor to make smaller shreds. Do not make a meal of it.